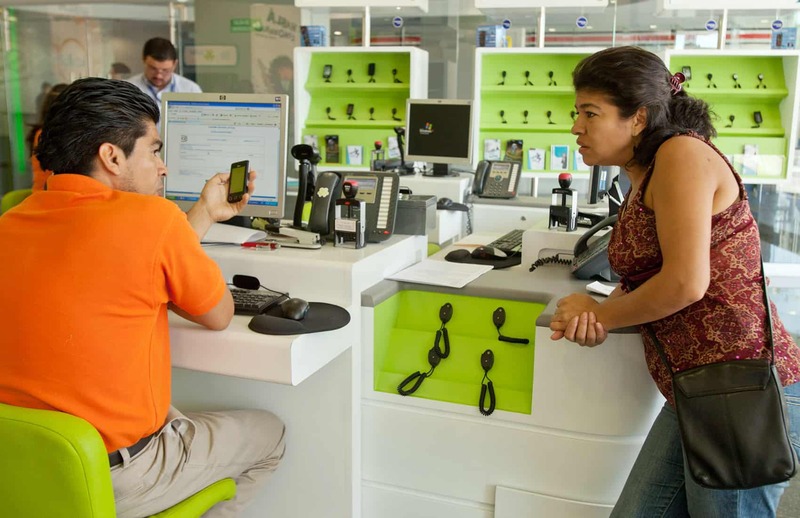 Amid a national debate over a proposed change in mobile Internet rates, a study released this week shows that rate plans from state-owned carrier Kölbi, part of the Costa Rican Electricity Institute (ICE), are generally less expensive than competing plans with similar features. New Jersey-based telecom pricing research firm Tarifica on Thursday presented the results of the study and the scores for postpaid mobile plans offered by ICE and private carriers Claro and Movistar. 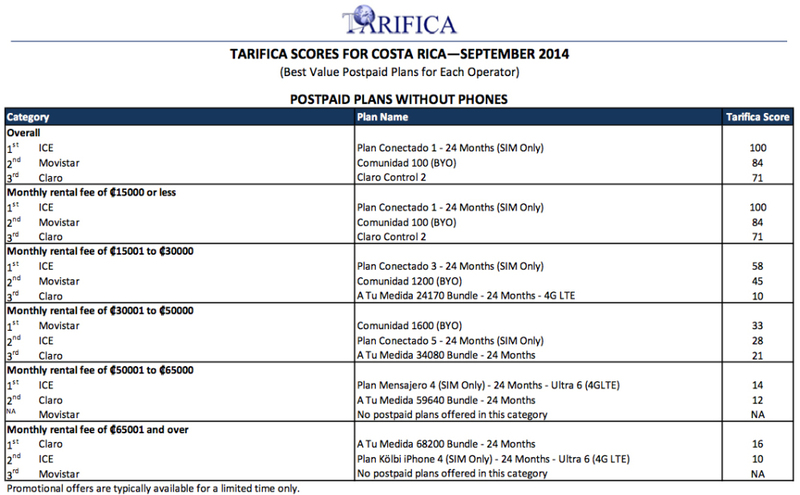 “What’s most interesting about the Costa Rican mobile market is that the factor driving price in many cases is a plan’s data speed, rather than the volume of included data,” said Tarifica Program Director Ken Dolsky. “This is highly unusual relative to other markets and results in many of the top scoring plans coming from lower priced market segments since they provide reasonably large data allowances, which is very important, but at lower although still usable speeds. In short, for many of the more expensive plans, the increase in speed was simply not worth the cost,” he added. Each of the two primary categories was further divided into five segments based on monthly cost. ICE-Kölbi was able to capture three of the segments for both the With Phone and Without Phone categories. “ICE’s success is attributable to a two-fold strategy. First, its plans were generally less expensive than competing plans with similar features – providing consumers with more for their money. Second, ICE offered the largest variety of plans, ensuring that it had an option targeted at every area of consumer need,” Dolsky explained. While not achieving the same level of success as ICE, private carrier Movistar fared relatively well, with the second highest scoring plan in both the With Phone and Without Phone categories. It also won three price segments outright. Although Movistar’s plans typically offered more minutes and SMS than those from ICE, the additional allowances were not enough to offset the latter’s lower prices. ICE-Kölbi currently dominates the mobile market that opened to competition from private companies in 2011. The public sector carrier since has lost 29 points of relative market share to 61 percent at the end of last year, according to a Telecommunications Superintendency’ (SUTEL) report issued last July. The postpaid user segment, however, has noticeably decreased. At the end of 2010, postpaid contracts outnumbered prepaid ones by 1.6 million to 1.5 million. This relationship reversed, and currently, prepaid users represent 81 percent (5.88 million lines) compared to 19 percent (1.22 million lines) of postpaid, SUTEL reported. 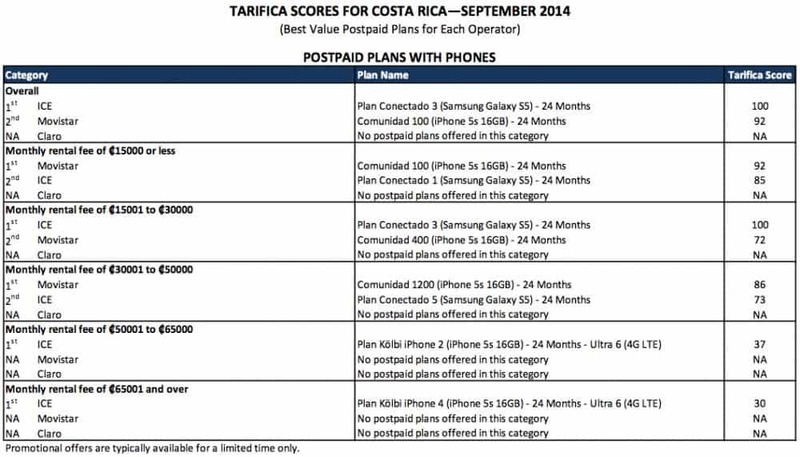 The Tarifica Score, the company states, is an advanced algorithm used around the world to evaluate mobile plans based on the value they offer consumers. It incorporates every aspect of a mobile plan including usage allotments, geographic coverage, data speeds and additional features, and weighs them against all of a plan’s associated costs to determine the ultimate consumer value. Also on Thursday, SUTEL officials appeared before justices of the Constitutional Chamber of the Supreme Court, or Sala IV, in a hearing to study a complaint against the proposed change in mobile Internet rates for both prepaid and postpaid plans. The proposal would charge users based on transferred data instead of connection speed. SUTEL officials at the hearing justified their proposal based on the need to streamline the use of networks because of spectrum shortage. SUTEL President Marileana Méndez said the agency will stand firm in its arguments, but will respect the Sala IV’s ruling. A private citizen who filed the complaint, identified only by the surname Chacón, did not attend the hearing. Instead, the argument against changing the rates model was presented by experts from the Ombudsman’s Office and the Science and Technology Ministry, who noted a lack of information in SUTEL’s request. They also questioned its accuracy, including the claim that consumers would pay less with the proposed change. SUTEL’s request fails to explain how that would happen, opponents said. Justices now will have 30 days to issue a ruling.